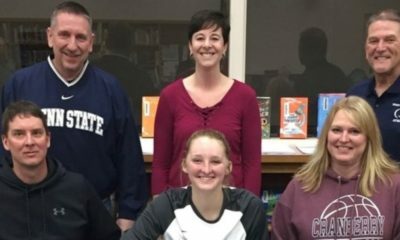 CLARION, Pa. – EmmaRae Easton picked the best possible time to have the best game of her high school career. 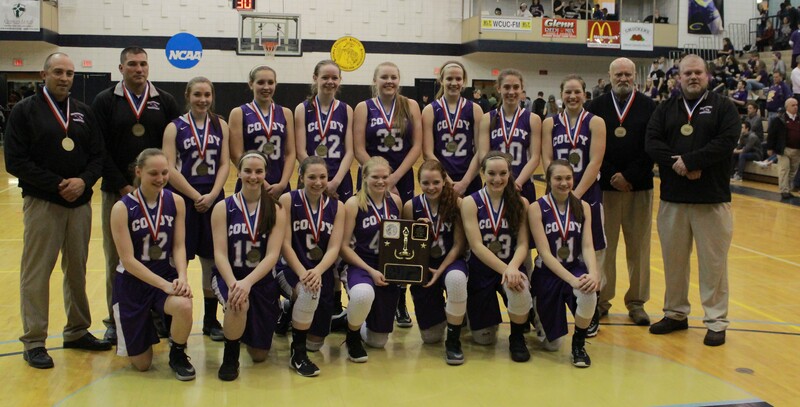 Easton knocked down a career-high six 3-pointers, including a buzzer-beater at the end of the third quarter, while scoring a career-best 22 points to lead Coudersport to its second straight District 9 Class 2A title with a 63-45 win over Kane Saturday at Clarion University’s Tippin Gym. “Mr. 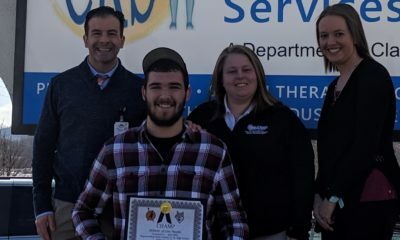 Green (Coudersport head coach Brian Green) was telling me to aim high and shoot for the back of the rim,” Easton said. Green said he has been trying to get Easton, who averages 8.0 points per game with a previous career high earlier this season against Galeton, to take more 3-pointers. Easton was 4 of 4 from 3-point range in the first half and was a big reason the Lady Falcons held a 26-25 halftime lead on the top-seeded Lady Wolves, who had an early season win over Coudersport. Listen to more of Keck and Easton’s thoughts on the game. Kane actually took the lead early in the third quarter, 27-26, on an offensive putback from Ella Marconi, who had 13 points and nine rebounds, including seven offensive boards. But Keck started a quarter-ending 19-4 run with a pair of free throws, and Easton followed up with a basket and then by hitting two of three charity shots after getting fouled shooting a three to push the lead to 32-29 with 3:24 left in the quarter. Chelsey Streich then nailed a 3-pointer with around three minutes left to push the lead to 35-29. Less than two minutes later, Keck pushed the lead to nine with a three of her own, as she scored 12 of her 18 after halftime. The lead got to double digits for the first time, 42-31, when Rosalyn Page hit two free throws with 1:06 left in the quarter, but Trinity Clark, who had a team-high 18 points for Kane, seemed to give the Lady Wolves some momentum when she had a steal and a layup to cut the deficit to nine, 42-33, with eight seconds to play in the half. 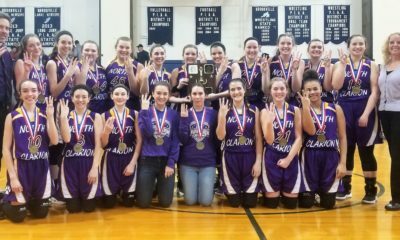 But Sarah Chamber found Eaton around the Clarion “C” on the Tippin Gym floor, and Eaton banked home the triple to give Coudersport a 45-33 lead heading into the final eight minutes. Chase is what Coudersport made Kane do, and it forced the Lady Wolves to foul. The Lady Falcons went to the line 20 times in the fourth quarter making 13 of them including seven from Keck to seal the school’s second straight title. Both teams enter the PIAA playoffs. Coudersport plays the fifth-place finisher out of the WPIAL, California (Pa.) while Kane takes on third third-place finisher out of District 6, Bellwood-Antis. Mikayla Gunn 0 0-0 0,Tianna Bowser 0 1-2 1, Lauren Stimaker 2 0-0 4, Dana Dubots 0 0-0 0, Chelsey Streich 1 0-0 3, Katelynn Plumstead 0 0-0 0, Sarah Chambers 0 3-6 3, Haley Keck 4 9-14 18, Hope Daisley 0 0-0 0, Shaelyn Black 1 4-4 6, Adrian Page 0 0-0 0, EmmaRae Easton 7 3-4 22, Kayle VanWhy 0 0-0 0, Rosalyn Page 2 2-2 6. Totals 17 21-31 63. Caitlin O’Hara 0 0-2 0, Sierra Hillman 0 0-0 0, Hannah Buhl 1 0-0 3, Rachael Morgan 4 1-2 9, Ainsley Saf 0 0-0 0, Emily Bucheit 1 0-0 2, Ella Marconi 5 3-7 13, Audri Marconi 0 0-0 0, Trinity Clark 8 0-0 18, Raeann Asel 0 0-0 0, Sarri Swanson 0 0-0 0, Rainee Wright 0 0-0 0, Hannah Brown 0 0-0 0, Rachael Buhl 0 0-0 0, Emma Ely 0 0-0 0, Katlyn Young 0 0-0 0, Rachel Haight 0 0-0 0. Totals 19 4-11 45. Three-pointers: Coudersport 8 (Easton 6, Streich, Keck). Kane 3 (Clark 2, Hannah Buhl).